Ok, I've done it. I've jumped on the buffalo chicken band-wagon. But... Boy, was it worth it! 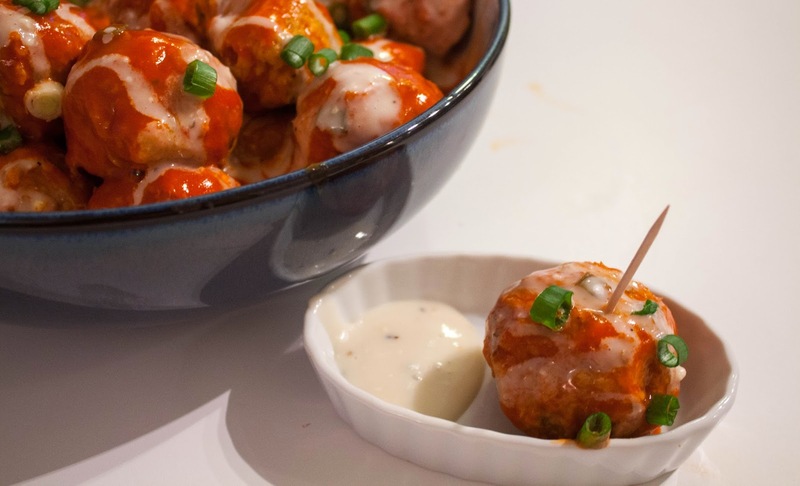 These make for a great party appetizer. I recently brought them to a housewarming party, and while a tad bit messy they sure pack a punch. These are super easy to whip up and can be kept warm in a slow cooker until you're ready to serve them. I will admit that I was a little hesitant to make this recipe, ground chicken just doesn't sound very appetizing to me but they turned out great! They had a nice consistent texture, and not chewy at all like I was expecting. Preheat oven to 400 degrees. Lightly grease/spray cookie sheet. In a large bowl, combine ground chicken, egg, breadcrumbs, salt, onion powder, pepper, and 2/3 cup of green onions (reserve the rest for garnish). Mix well ( I like to get messy, so I just use my hands). Roll into 1 1/2 to 2 inch meatballs. Bake meatballs just until the bottoms are browned and the meatballs are firm, about 8-10 minutes. 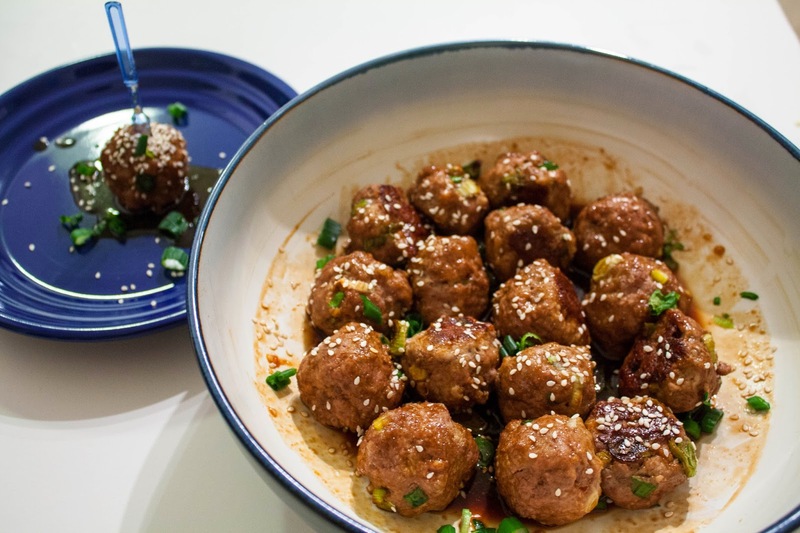 Transfer meatballs into a slow cooker. Cover with Frank's Red Hot sauce. Place lid on slow cooker and cook on high for 2 hours. 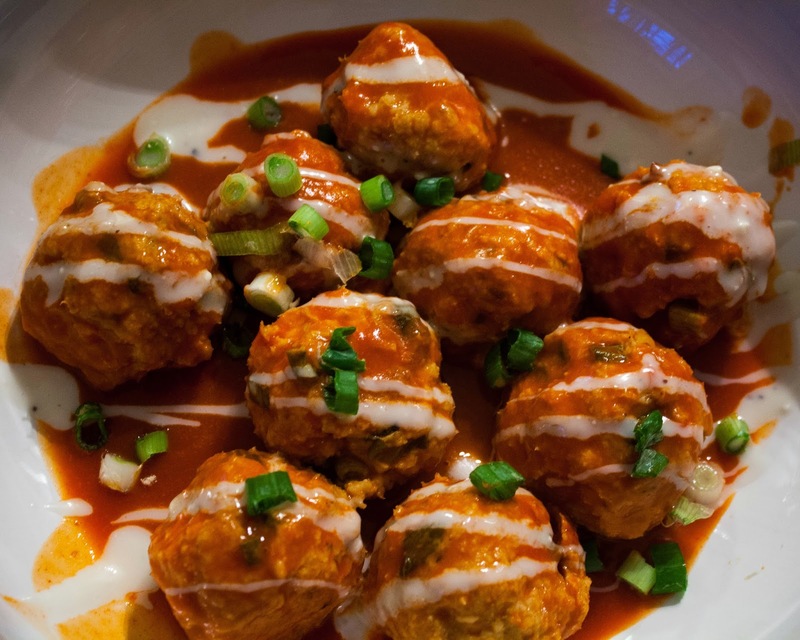 Garnish meatballs with ribbons of blue cheese dressing and reserved green onion. Serve with extra blue cheese sauce for dipping. I'm really excited about this fun DIY project! It came out looking great and was REALLY EASY to make! I also love how inexpensive it was to finish. This project cost me less than $15! 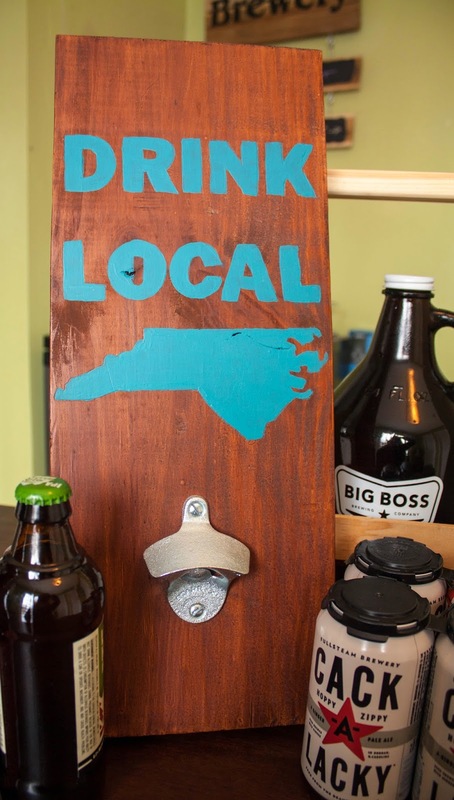 I made this beer bottle opener to hang in our kitchen/dining area while stuck in the house during the Raleigh Snowpocalypse today. I am so glad that I had obtained all my materials earlier in the week - there was no venturing outside for us the past day and a half! I also learned that North Carolina is really hard to paint!! I'm used to Vermont which is basically just a wonky rectangle. I can't imagine being a kindergartner and trying to draw North Carolina... that's just not fair, and those kids in Colorado have it SO easy! Piece of wood - I used an 18" piece of a 2 x 8 Pine Board from Lowe's for $6. I stained it with some leftover stain from my "No Tools" Headboard project. I thought about using pallet boards but I didn't have any that were wide enough. Beer bottle opener. 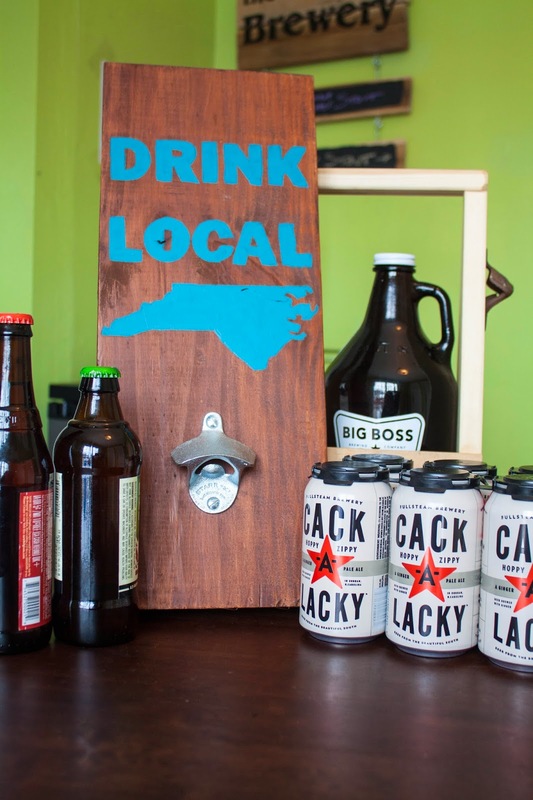 I obtained mine for $7 from my favorite local home-brew supply shop - Atlantic Brew Supply. Cut and stain your wood if necessary. 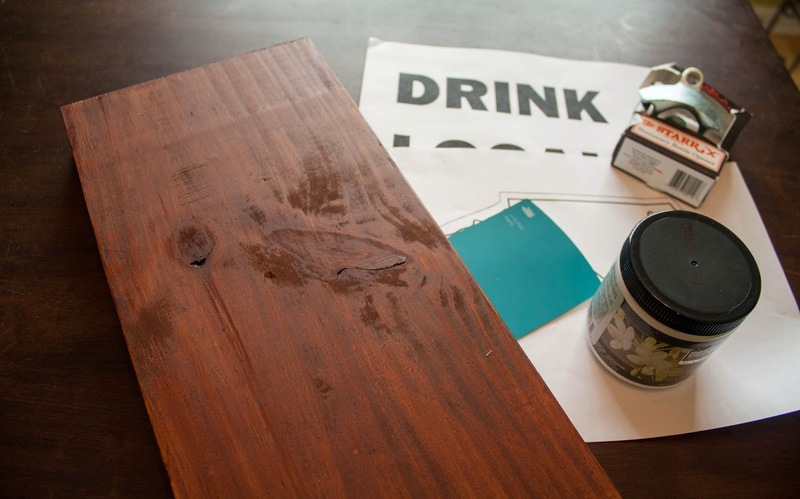 Stain at least 24 hours before painting so that it soaks in and dries completely. Print out your text and/or state outline with a computer. 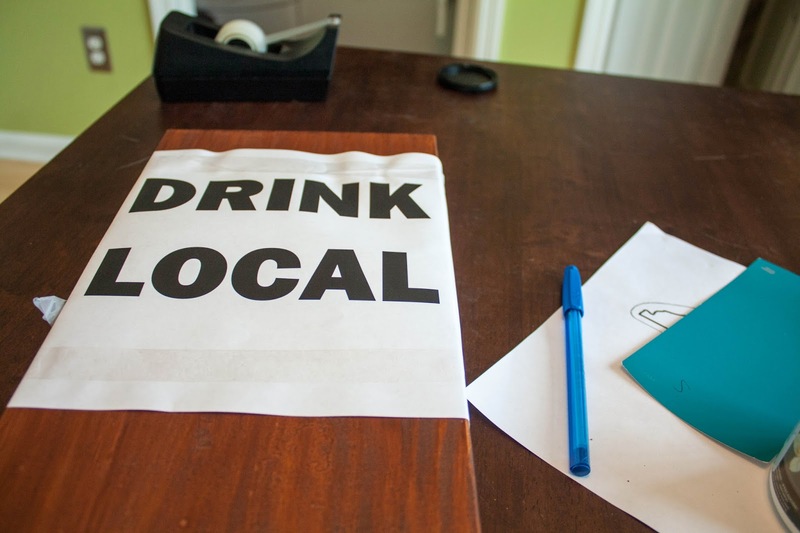 Tape the printed out text to the board and trace over with a pen - pressing hard. 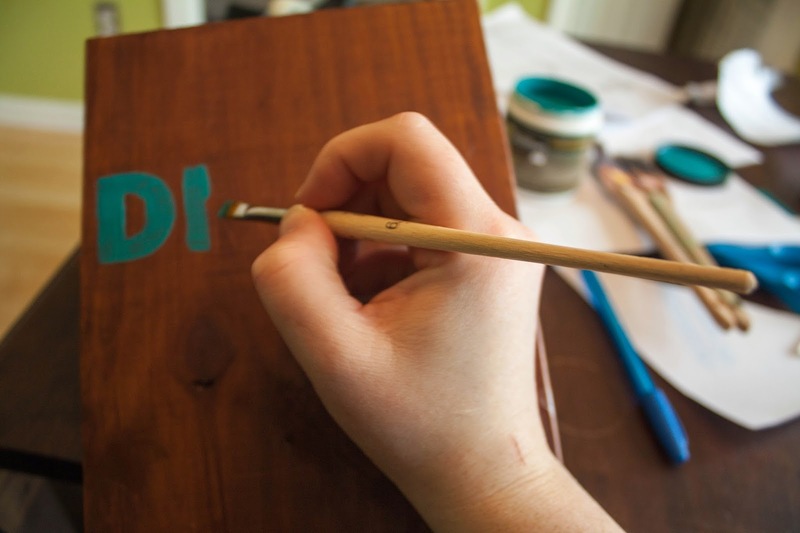 Pine is soft so this will leave an indent in the board that you can use as a guide to paint. Do the same with the state outline. Remove computer paper and paint. Allow to dry. I needed to do two coats of the teal paint in order to make it pop! the way I wanted. 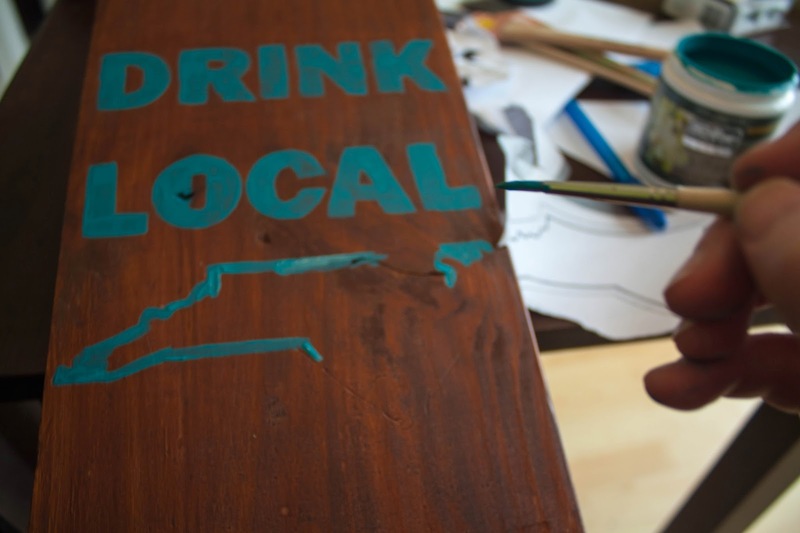 Once paint has dried, screw your bottle opener into the wood and that's it! You've got yourself a fantastic looking bottle opener! That's right, Wasabi Sriracha Deviled Eggs ... And they're fantastic! I've made these a couple of times now, making some tweaks to the recipe here and there and I think I've got it perfected. Now if only I can learn how to perfectly peel hard-boiled eggs, then we'll be in business. No seriously, is there a magic trick? Because I can't peel eggs nicely to save my life. Although they sound really spicy they're really not too bad, even our spice challenged friends enjoyed them. They creaminess of the yolk and mayonnaise really soften the heat from the wasabi and Sriracha while still capturing their distinctive flavors. In a medium saucepan, combine the soy sauce, chopped scallions, sugar and grated ginger. Add 1 1/2 cups of water and bring to a boil. Transfer the mixture to a heatproof bowl and let cool completely. Once cool, add the eggs to the soy sauce mixture. Cover with plastic wrap and refrigerate the eggs for 1 to 2 hours. Drain the eggs from the soy sauce mixture. Using a slightly moistened thin, sharp knife, cut the eggs in half lengthwise. Gently pry the egg yolks into a medium bowl. Mash yolks with a fork. 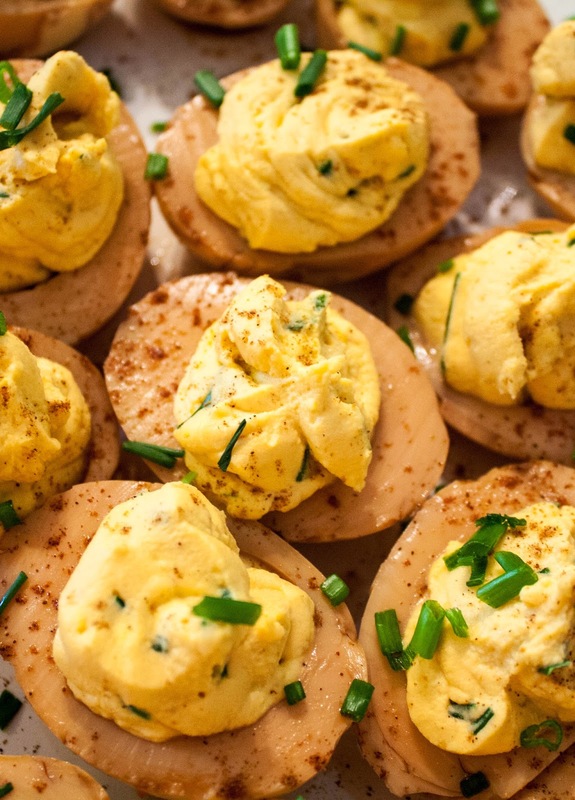 Stir the mayonnaise, Sriracha, wasabi and 3 tablespoons of the snipped chives into the mashed yolks. Transfer the mixture to a ziplock or pastry bag. Set the egg whites on a serving platter and pipe in the filling. 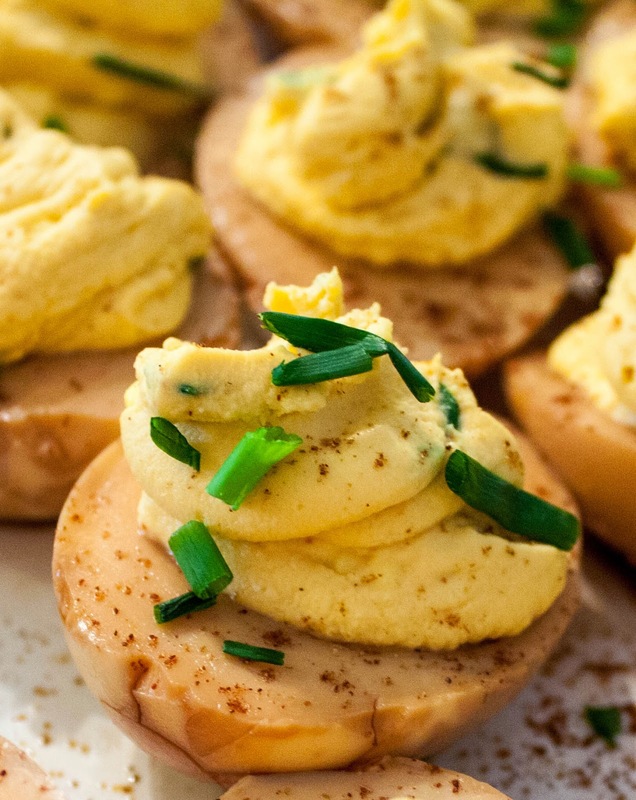 Sprinkle the deviled eggs with the remaining chives and the Chinese five-spice powder. Serve and Enjoy! This recipe is sure to be a party pleasing appetizer and a fun twist on a classic. 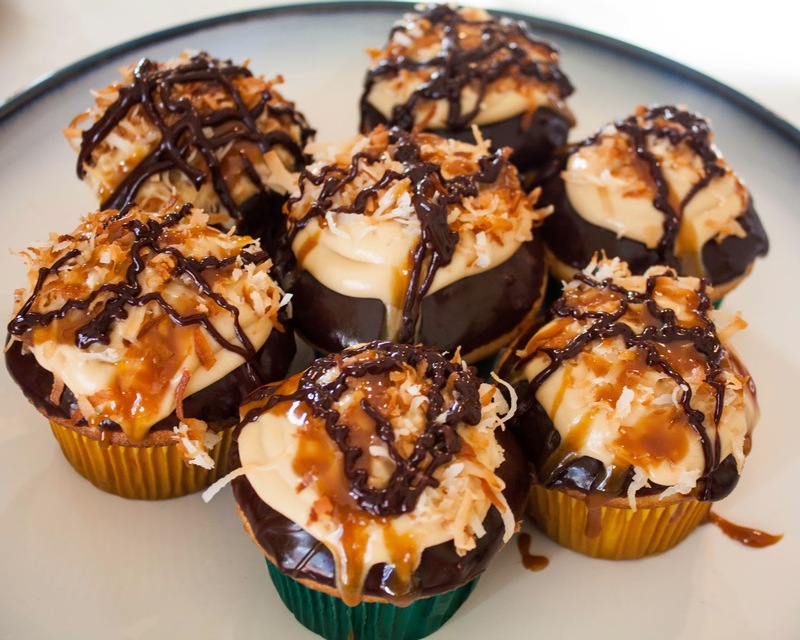 I made these tasty treats for our little Super Bowl get-together on Sunday and they are absolutely scrumptious! They are based off a recipe from my newest blog obsession - Cooking Classy. I sort of simplified the recipe by using a store-bought cake mix and caramel sauce rather than making them from scratch. This way I saved some time and still mastered a beautiful and delicious cupcake. I know I've said it before... but my friends are all amazing! We had such an awesome spread of food for the Super Bowl - I wish I had taken some photos. Yummy dips and spreads, Mariachi Mac & Cheese cups, homemade infused vodka, and so much more. I don't even watch football so for me the Super Bowl is all about the food and the commercials. 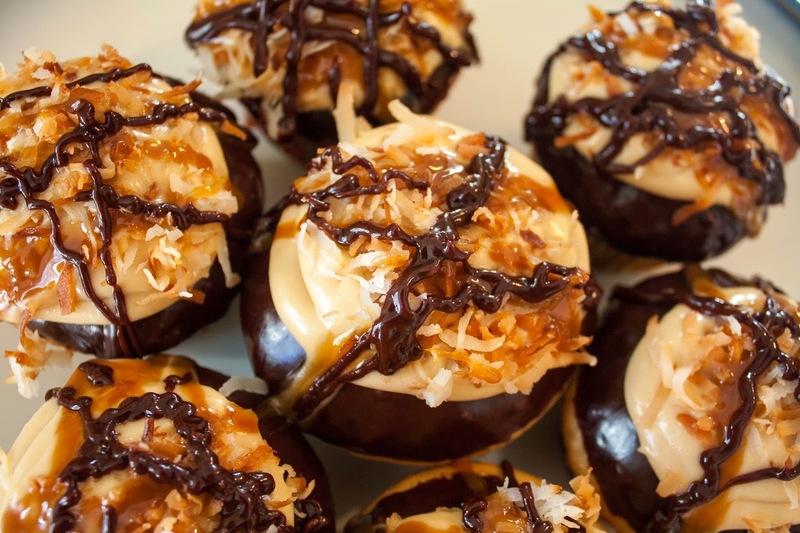 They are just DRIPPING with chocolate and caramel! 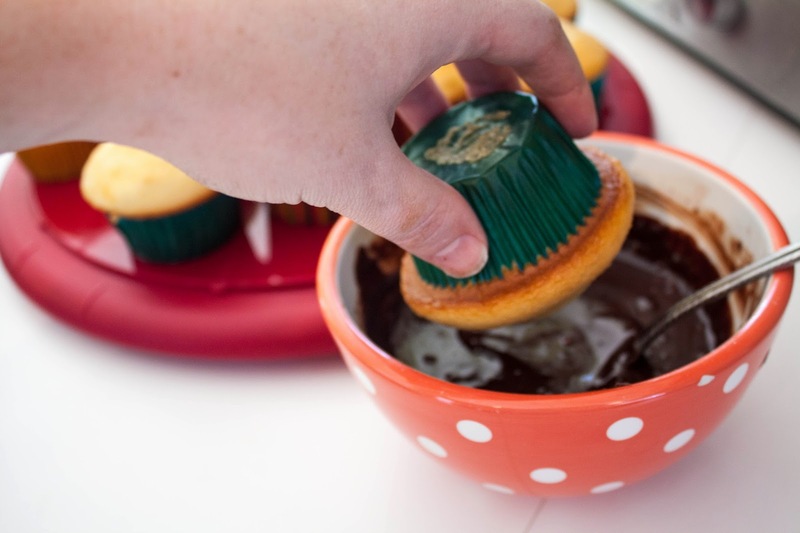 Mix and bake cake mix according to package directions into 24 cupcakes. Allow to cool completely. In a small, microwave safe bowl heat chocolate chips and heavy cream on half power in 20 second increments until well combined and smooth. 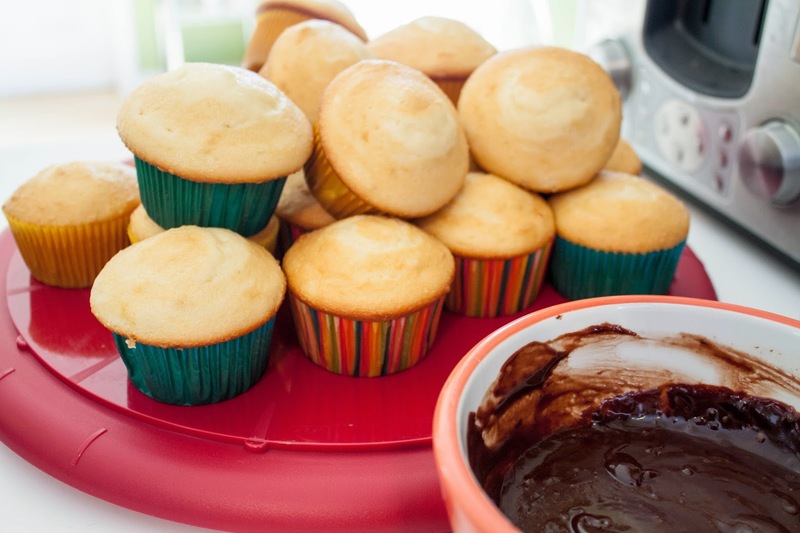 Dip tops of cooled cupcakes into chocolate, twisting to cover entire surface of cake equally. Set on a wire rack to cool. To make Caramel Butter Cream frosting combine softened butter and powdered sugar and mix with a hand or stand mixer until well combined. Add in caramel sauce and vanilla and mix on medium-high until light and fluffy. Pipe Butter Cream Frosting onto chocolate-dipped cupcakes. 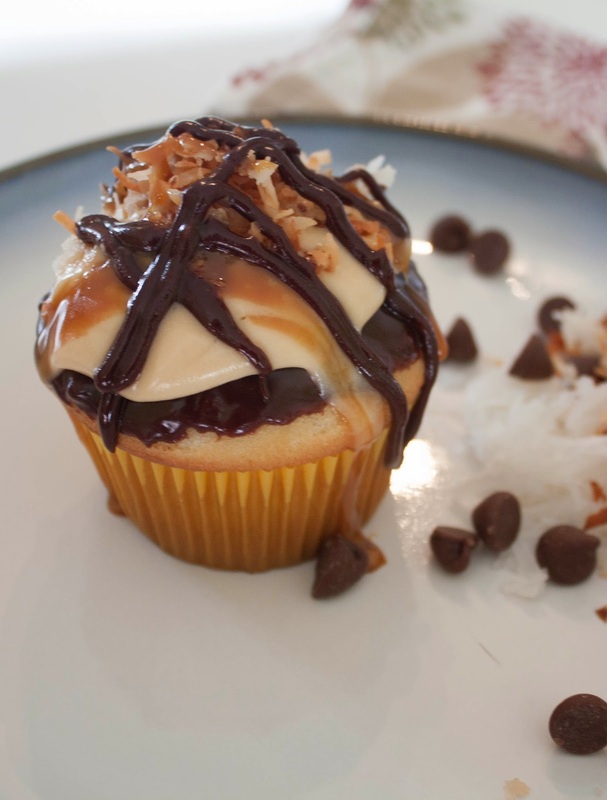 Dip frosted cupcakes into toasted coconut. 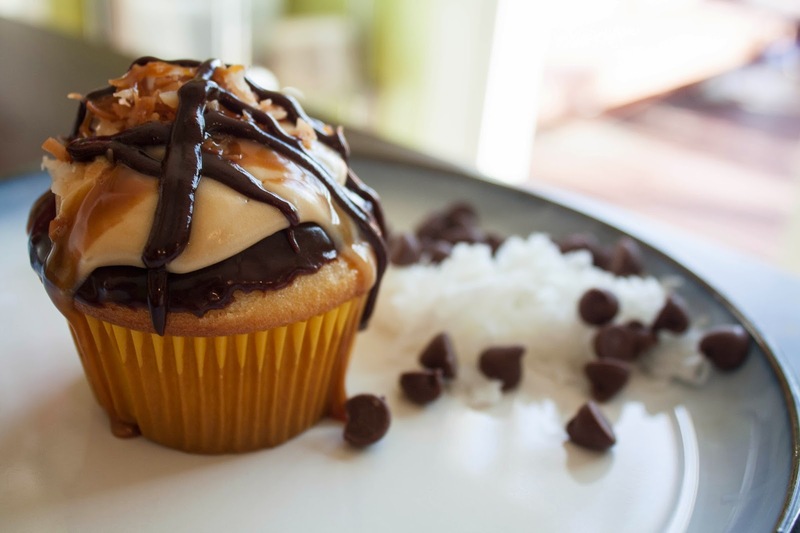 Drizzle with leftover caramel sauce and melted chocolate. Since the snow has hit the South a little by surprise the past couple of days... I figured I would share a nice soul-warming soup recipe to help ya'll (<-- see look, I can pretend to be a Southerner) escape the winter chill. 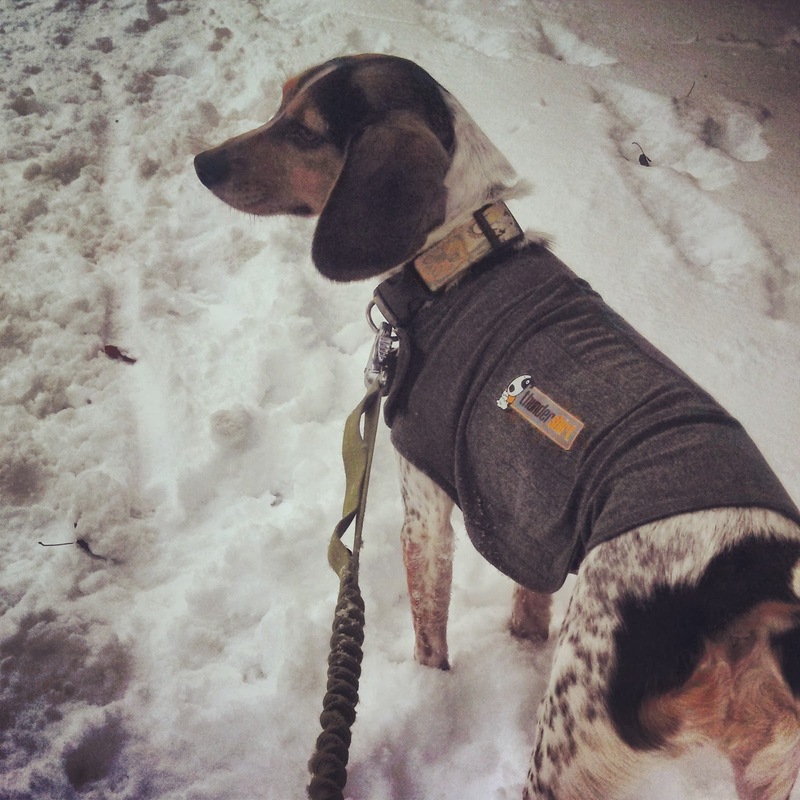 We got about 3 inches of snow in Raleigh which earned me a snowday - the perfect opportunity to share recipes on my blog! The dogs are LOVING the snow, we've been on a few walks already and they beg to go outside to chase each other in the snow. Not to mention the perfection of having a lazy day in front of a warm fire, Bailey's spiked coffee, and yummy pancakes smothered in Vermont maple syrup - I joked about being a snowday pro, I really think I've nailed it today! I love this recipe because it can be so versatile! I've made it vegetarian friendly with some yummy noodles or chock full of chicken for a really comforting dish. I tend to just dump whatever leftover veggies I have in the fridge... so be creative with this one! Here is a good base recipe to start off with. I would suggest doing chicken OR noodles but not both - you'll wind up with less of a soup and more of a messy noodle dish. Also, I've made the mistake of being overzealous with ingredients - moderation is key! 8 oz Mixed Mushrooms - Cremini, Oyster, Sliced Baby Bella, etc. I've also added snow peas, baby corn, carrots, green bell pepper depending on what I had left in the fridge...but seriously don't overdo it, I've made that mistake before! 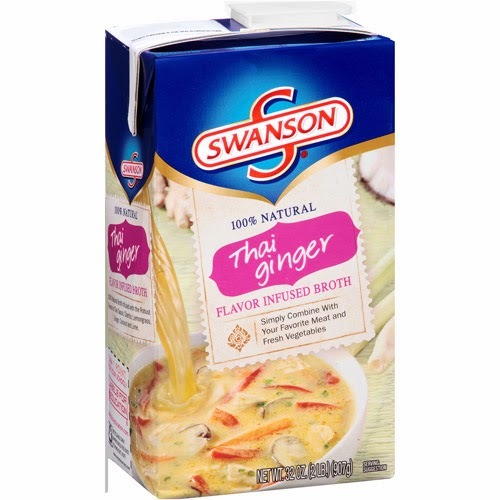 Whisk together broth, chili paste, coconut milk, fish sauce, brown sugar, and peanut butter in your slow cooker until well combined. Add in chicken (or not), bell pepper, onion, mushrooms, and ginger. Set slow cooker to HIGH for 4 hours. Add in frozen peas, lime juice, and rice noodles (if you're using them) cook on HIGH for an additional 15 - 30 minutes, or until noodles are cooked. Top with fresh cilantro and/or basil and enjoy! 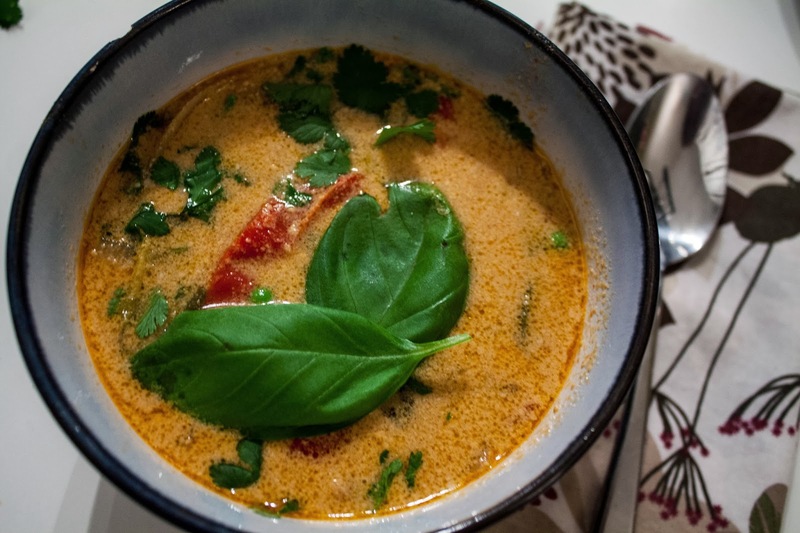 Doesn't this soup make you feel a bit warmer just by thinking about it!? 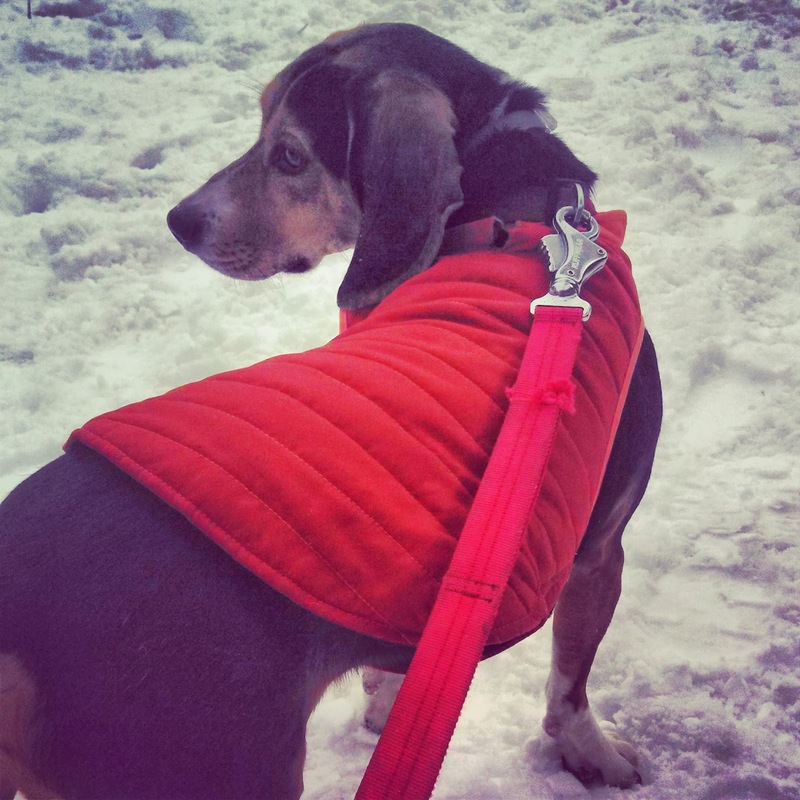 I had my first snowday in years today and what better way to spend my time than work on the blog? I have a few recipes and photos that I've been meaning to work on from a while back but I was just so excited about this recipe that I couldn't wait to post it - it got to cut to the front of the line. This is another one of the recipes I made for my birthday party and just HAD to remake in order to take photos and blog because they are just THAT GOOD. I also love that these are just so easy to whip up.I don't need to set aside any real time for prep --> chop green onion, mix everything together and VOILA! prep is done! It's the perfect appetizer to make right before your guests walk in the door, stick them in the oven and they're finished, hot and ready to be devoured right as your guests are arriving. 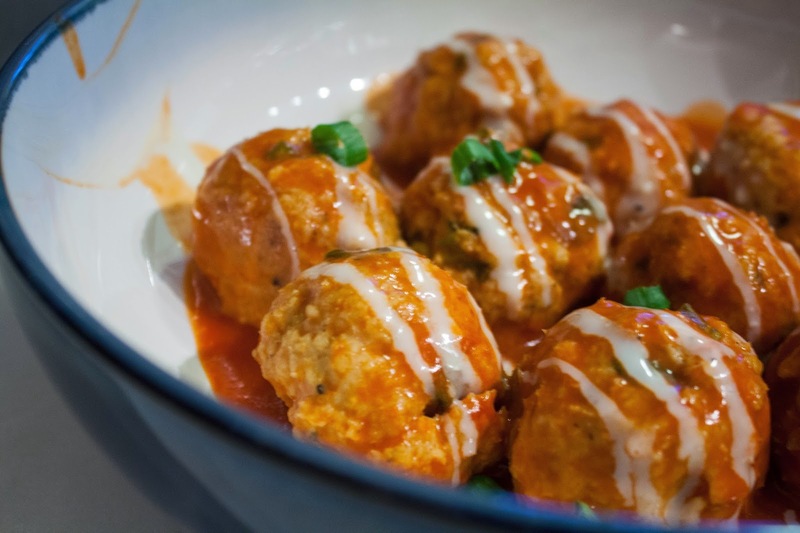 I've never really been a meatball as an appetizer fan - I just personally think that they tend to be really heavy, especially when they are drowning in marinara. 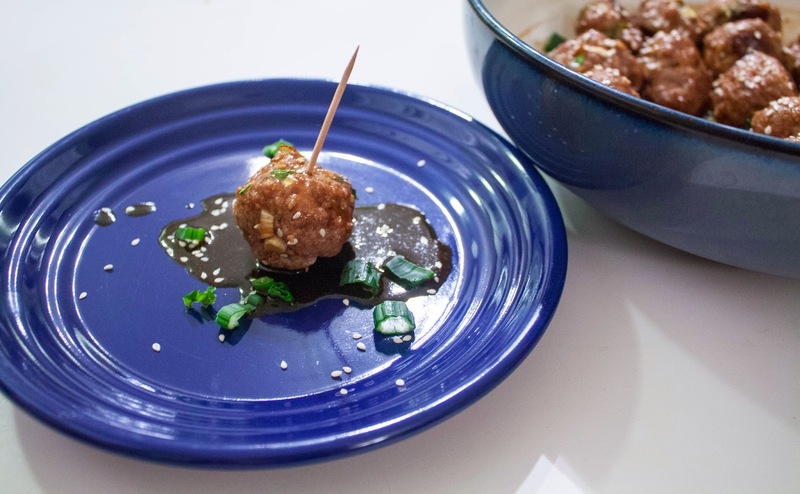 These meatballs do not have that heaviness, but they have a nice balance of savory and sweet while feeling lighter than your average meatball. Preheat oven to 400 degrees. Lightly coat cookie sheet with cooking spray. 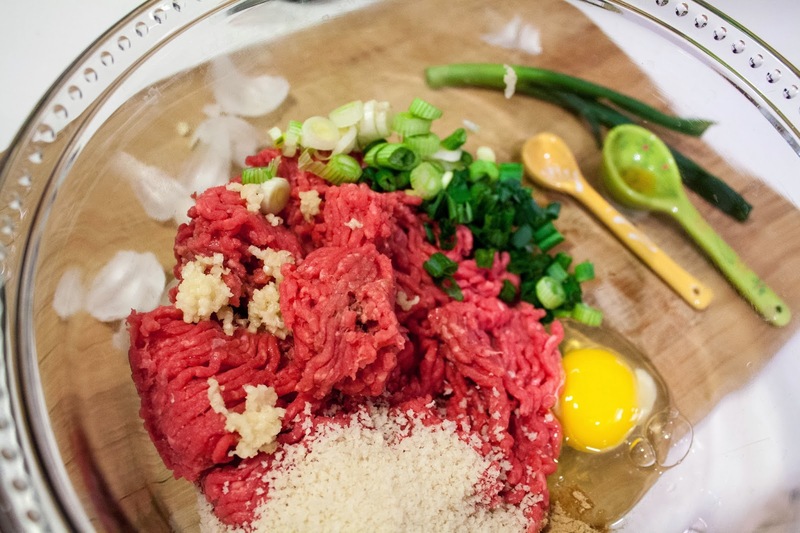 Mix ground beef, sesame oil, panko, ginger, egg, garlic, and about 3/4 of your chopped onion (reserving some for garnish) in a large bowl. I use my hands - It's fun. Mix well, making sure to incorporate all the ingredients evenly throughout. 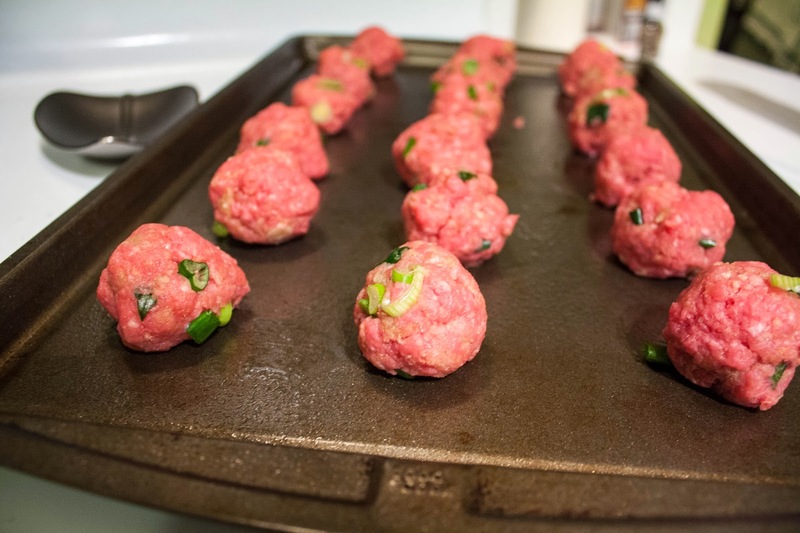 Form your meatballs into 1 to 1 1/2 inch balls.You should be able to make at least 18 meat balls. I usually do 6 rows of 3 meatballs on my cookie sheet, leaving enough space between each ball to cook evenly. Cook at 400 degrees for about 12 minutes or until cooked all the way through. While your meatballs cook, whisk together your sauce ingredients. 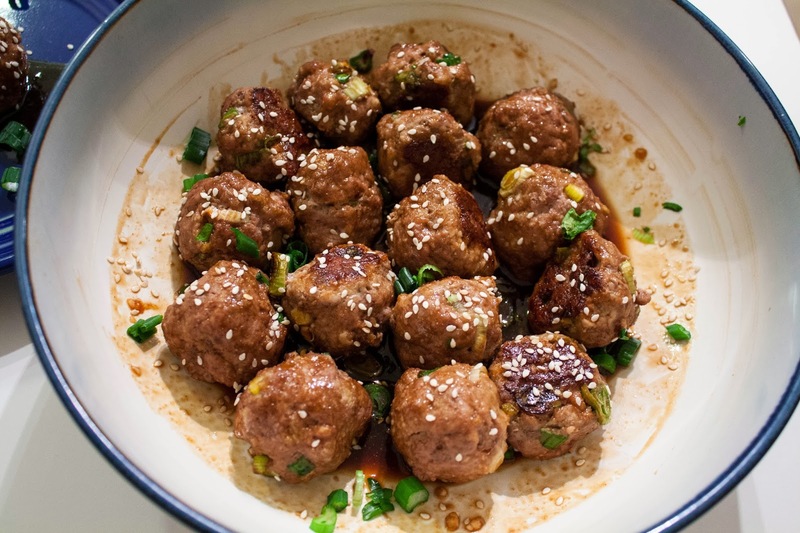 Once cooked, place your meatballs in their serving dish, top with sauce, garnish with reserved green onion & sesame seeds. Holy Yum & Holy Easy - the best of both worlds! I am still in a food coma after making this for dinner tonight. 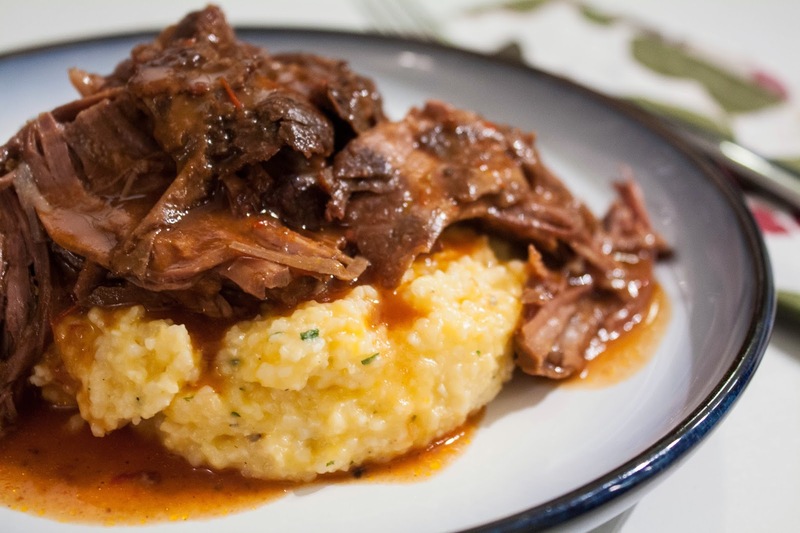 It is just so good that it's hard to stop shoveling mouthful after mouthful into your mouth of creamy, cheesy, ranch grits smothered in tender, moist, barbecue beef. And the sauce! Oh, the sauce! It's to die for. I've never been too much of a pot roast fan... 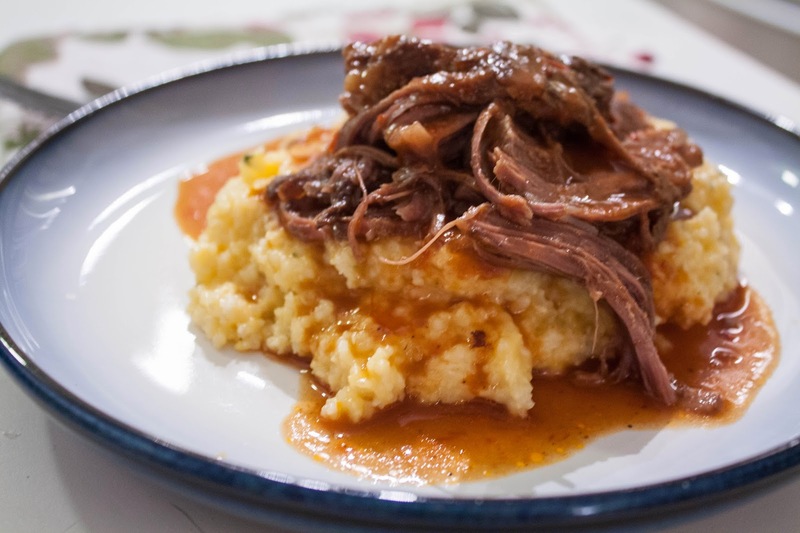 I think it's because as a kid pot roast was always served to me as dry, tough pieces of unseasoned meat but now I have a couple pot roast recipes in my regular rotation. This recipe is so easy. 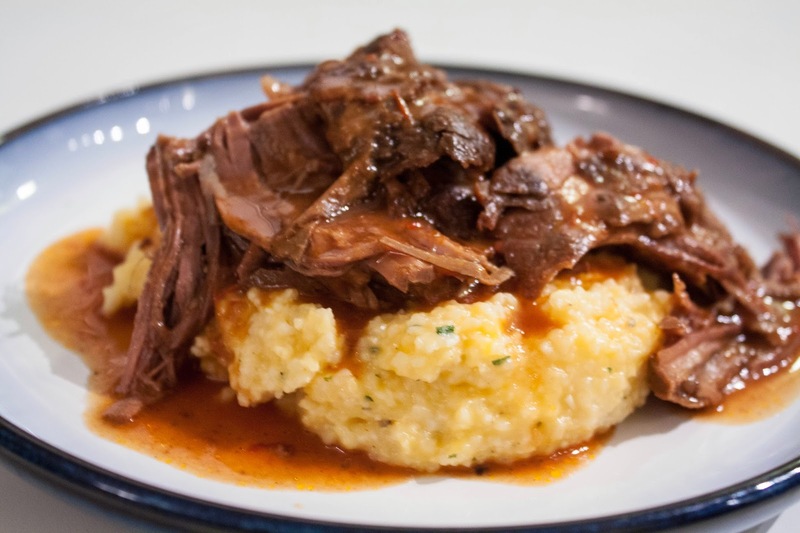 Just a few short minutes of prep is all it takes to set the slow cooker and then be on with the rest of your day. The grits whip up in a jif as well. This recipe has been adapted from Plain Chicken after seeing it posted on Pinterest. I am so happy to have stumbled upon it. In your slow cooker, sprinkle garlic powder, salt and pepper over roast. Top with Coke, chili sauce, Worcestershire and Tabasco Sauce. Cover and cook on high for 4-6 hours or low for 7-9 hours depending on the size of your roast. I just made a 3 lb roast on high for 5 hours and it was perfect. Once your roast is cooked remove it from the slow cooker, momentarily. Combine cornstarch and milk in a small bowl, mix well until there are no clumps. Pour the milk mixture into the juices reserved in the slow cooker, mixing well. Place roast back into slow cooker. Cook on high for an additional 15 minutes to thicken up the sauce. In a medium-large saucepan bring chicken broth to boil. I like my grits kind of stiff, almost like a mashed potato, if you prefer yours to be a little wet, add more chicken broth. Once boiling, slowly add in grits, while stirring. Reduce heat to medium low. Cook for 5 minutes for quick grits or 15-20 minutes for regular grits. Stir in ranch packet and cheese. 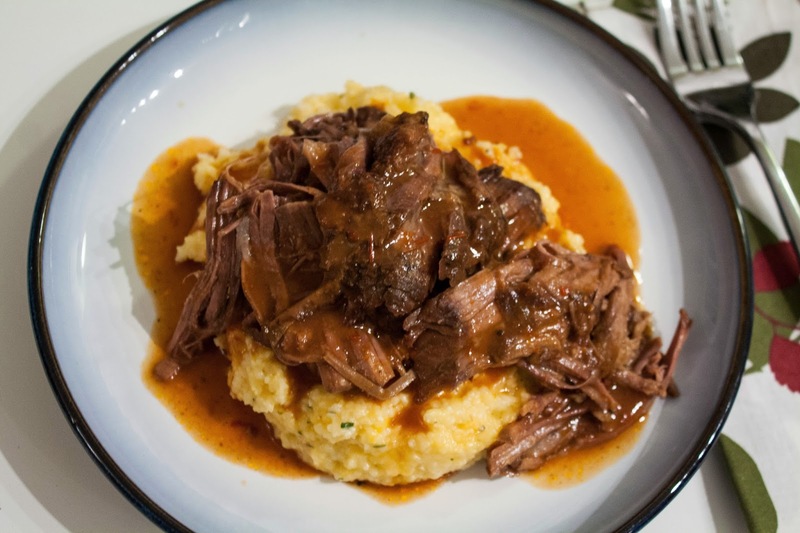 Serve your roast over the grits, with sauce generously poured over top. It's amazing that this much deliciousness can come from so little effort.